Softcover book, 128 pages, including black-and-white and color illustrations. 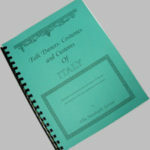 Seventeen dances with description and notated music, information about Italy, costumes, customs, etc. Comes with a CD of the recorded music to accompany the dances. Price: $25.00 plus $3.95 for handling and postage.